The Looks Like Chicago project is an initiative of Silk Road Theatre Project. Founded as a direct response to the perceptions of Arab Americans and Muslim Americans after the terrorist attacks of September 11, 2001, Silk Road Theatre Project has, since its inception, been dedicated to promoting diversity and cross-cultural dialogue in its home city of Chicago. Propelled in part by an on-going conversation between Time Out Chicago journalist Novid Parsi and Silk Road co-founders Malik Gillani and Jamil Khoury, Time Out Chicago devoted its cover story on July 27, 2006 to a compelling article written by Parsi and Christopher Piatt entitled "Why is Chicago Theatre so White, and how can we fix it?" 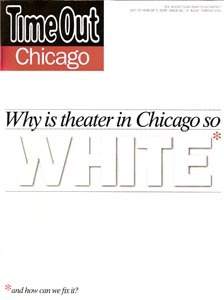 The article posited that in a city with no ethnic or racial majority, Chicago's theatre scene does not reflect Chicago's diversity; it does not, in effect, look like Chicago. Gillani and Khoury thus took up the challenge they themselves helped articulate and created a bold and unprecedented initiative called Looks Like Chicago. The aim of Looks Like Chicago is not to attract more white audiences to "ethnic" theatres, or to attract audiences of color to traditionally "white" institutions. Rather, Looks Like Chicago celebrates the entire spectrum of theatre in Chicago, and strives not only to bring new audiences to each of the participating theatres, but also to create an ongoing dialogue about the nature of diversity on Chicago's stages. The four theaters participating in the inaugural year of Looks like Chicago each have a specific niche: Congo Square Theatre Company is committed to producing works spawned from the African Diaspora; Remy Bumppo specializes in European-American and British plays; Silk Road Theatre Project showcases playwrights of Asian, Middle Eastern, and Mediterranean backgrounds; and Teatro Vista "Theatre with a View" is committed to sharing the riches of Latino culture and the diversity of Latino experience. The four participating companies are rooted in the communities and experiences they represent. All four share a commitment to cultural authenticity and artistic integrity, and each is endowed with a unique voice, perspective, and aesthetic. Throughout the season, Looks Like Chicago members will experience the work of each of these exciting Chicago theaters, becoming a participant in a truly multi-cultural experience of Chicago's rich diversity. At the end of the season, participants will come together at a special Town Hall Meeting to discuss their experiences attending Looks Like Chicago performances, as well as the future of diversity on Chicago's stages. Looks Like Chicago is supported by a grant from .